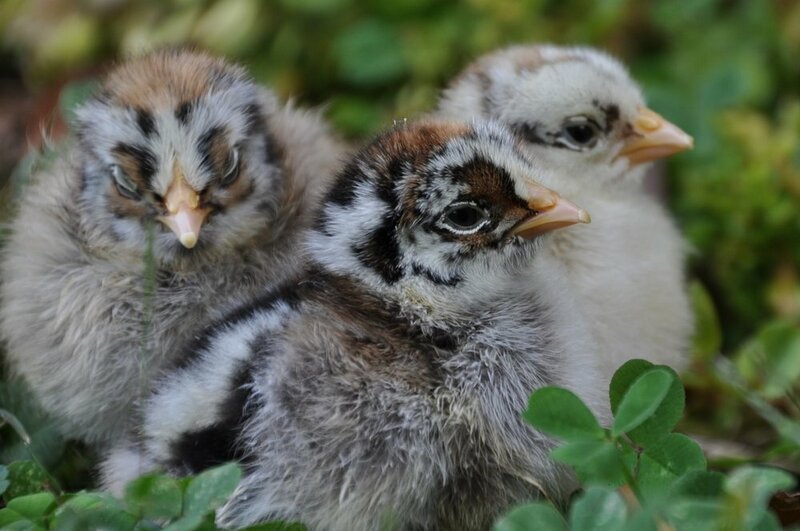 Silver Spangled Spitzhauben chicks from Greenfire Farms lines. BREED INFO HERE. We do not have started pullets or sexed chicks in this breed. French Black Copper Marans. The darkest of the chocolate egg layers. Our hens are relaibly producing a #6 to #7 on the Marans Club of America color scale. Our Olive Eggers are a cross of Legbar hens with a Black Copper Marans rooster. This will produce a lovely Olive colored egg and the chicks can be sexed at hatch. These chicks are black in color, and have partially feathered feet, like the Marans. The farm here on Thunder Creek has been in the Hypes family for 125 years. Our girls are the 6th generation raised on this land. During it's history, the farm has been home to a small dairy, beef cows, pigs, and now bees and poultry. While chickens have always been kept here on the farm, we have dedicated our time and effort to select and improve breeds that are rare beauties and capture the attention of both experienced and new chicken enthusiasts. We guarantee the health of our flock and any chicks we send to you. When not working with the chickens here on the farm, Tanya (Doctor Wally) is a small animal Emergency Veterinarian. Before attending Vet school, she worked in the poultry industry and towards a Master's degree in Poultry Nutrition. Visit our BLOG to read about the latest happenings on the farm and see more pictures of the breeds.